The 2011 Northeastern Reef Aquarium Conference (NERAC) will be held on March 19, at Atlantis Marine World 431 Main St, Riverhead NY. The main events will be held from 8:30 am – 6:00 pm, followed by drinks and dinner from 6:00 pm – 11:00pm. The sixth annual conference will feature the UK’s own Simon Garratt, who will discuss pushing the boundaries of reefkeeping. Ken Nedimyer will have a presentation about coral restoration. Richard Ross will go over how to make decisions about your reef tank. And Paul Whitby will cover reef aquascaping. The $35 admission fee includes a free lunch catered by Atlantis, Aquarium Admission, a raffle for tons of great stuff, including a chance to snorkel in Atlantis’ 20,000 gallon reef tank!! That’s would a sweet win! The cocktail hour and dinner are an additional $50, and include an open bar, reef-side dinner, BTS tour by the Atlantis curator. 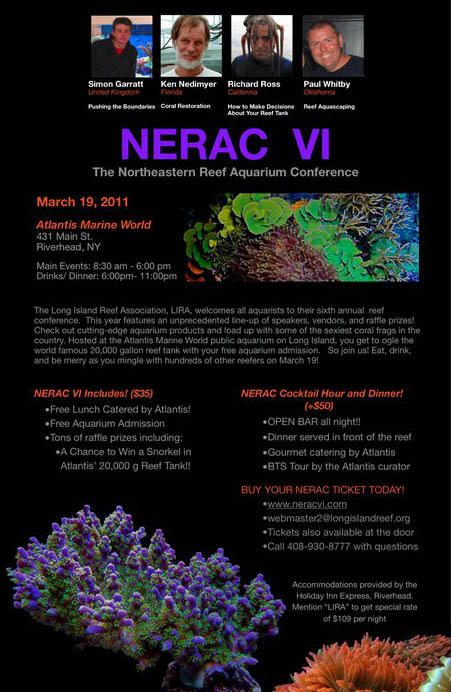 Tickets are available at www.neracvi.com, webmaster2@longislandreef.org, as well as at the door. Please call 408-930-8777 with any questions. A special rate ($109/per night) is available for accommodations at the Holiday Inn Express, Riverhead, with the mention of “LIRA”.